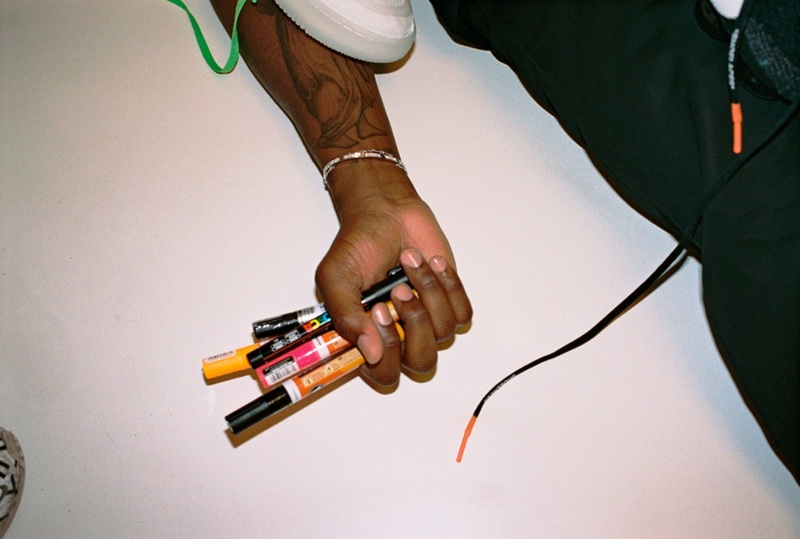 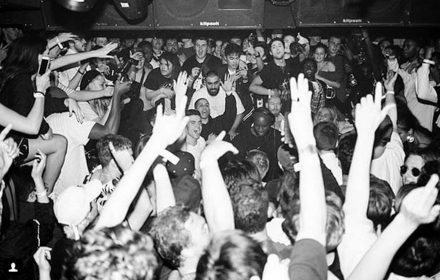 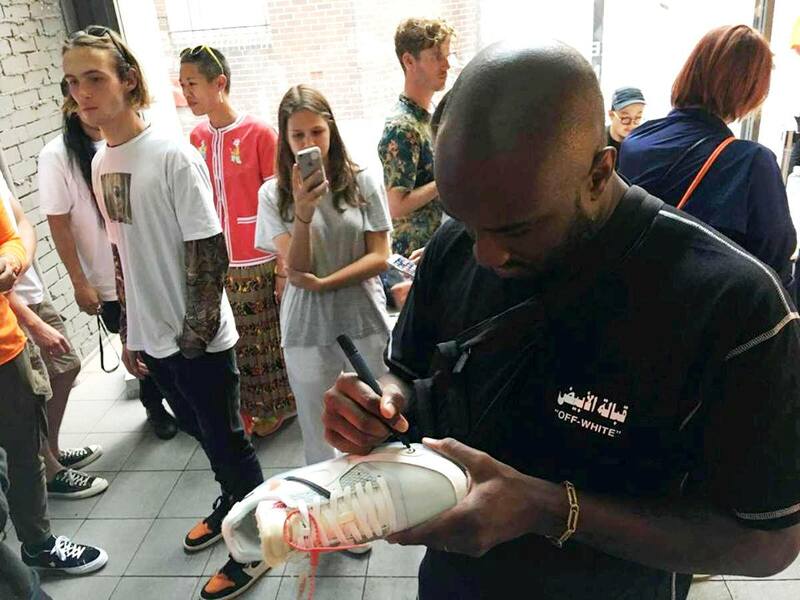 Having lent his creative direction to everyone from Kanye West to Lil Uzi Vert, Abloh’s influence has manifested itself in all corners of contemporary youth culture. 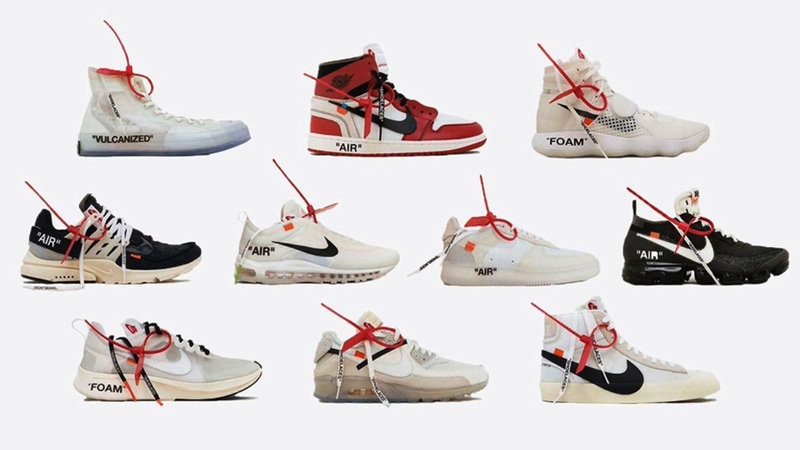 Most recently, he was approached by Nike to deconstruct some of its most revered sneakers, resulting in ‘The Ten’ collection which has generated worldwide hype with its DIY aesthetic. 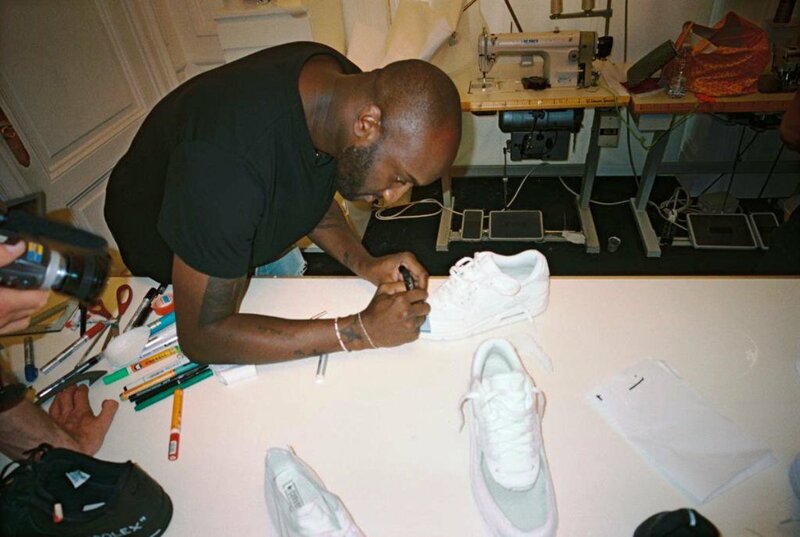 From court classics like the Jordan 1 to the lightweight, bubble-centric Vapormax, Abloh left his signature mark on Nike’s arsenal of footwear favourites. 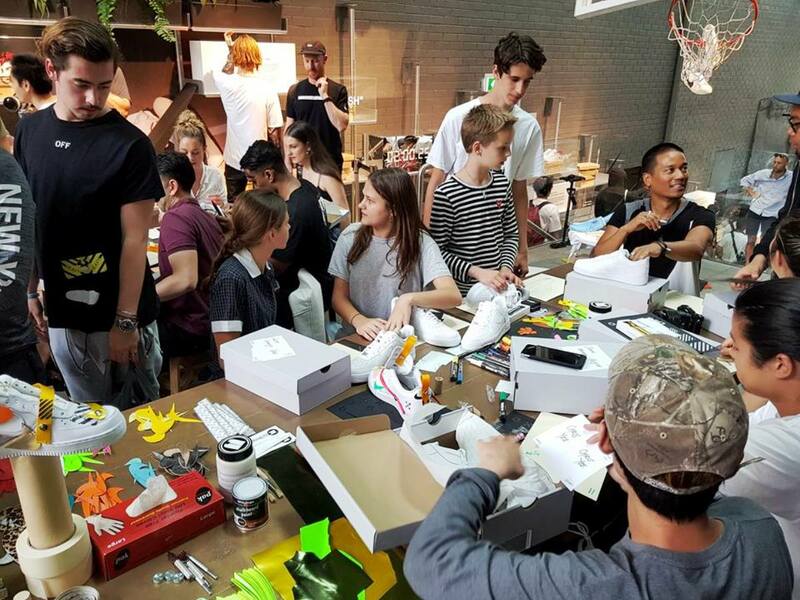 Every element of the collaboration — from the physical products to the digital presence — focuses heavily on presentation, and regardless of the opinions we hold towards each shoe, it is clear that every element has been designed to challenge our perception and expectations. 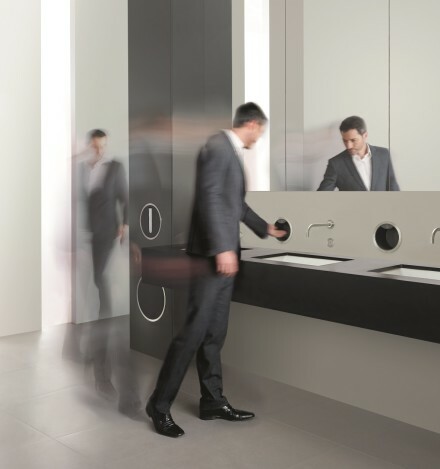 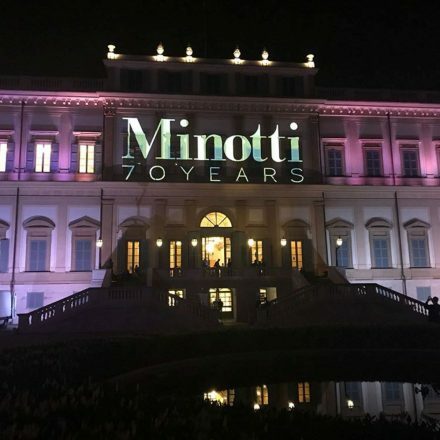 The reinterpretation of classics will always polarise opinions, but by testing our perception of “acceptable design” and appealing to a niche, the future boundaries are set further and further apart, generating bolder and more daring designs. 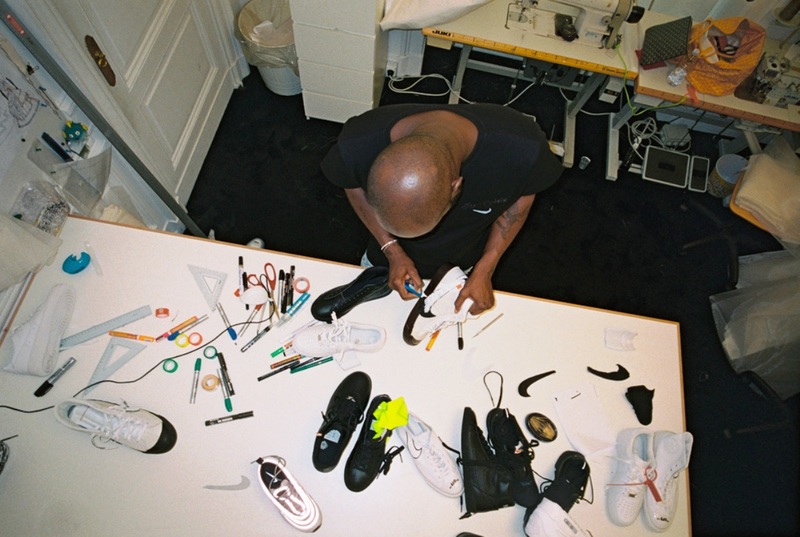 Virgil took staple Kicks within Nike’s armory and treated each as a blank canvas, a design playground on which he has free roam. 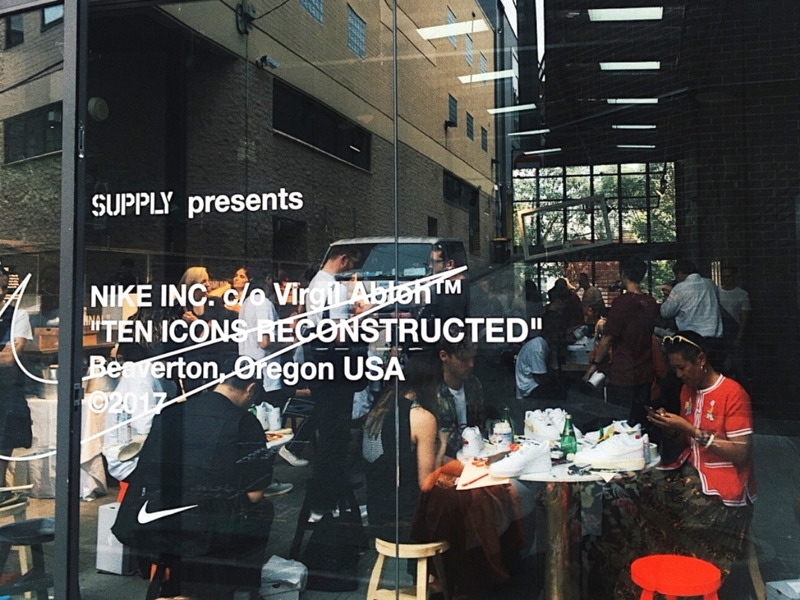 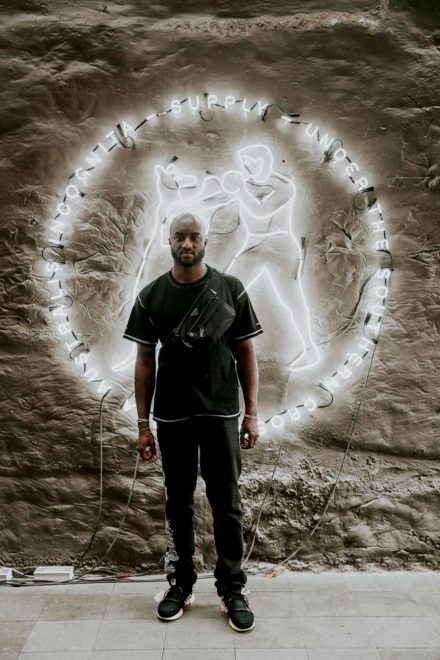 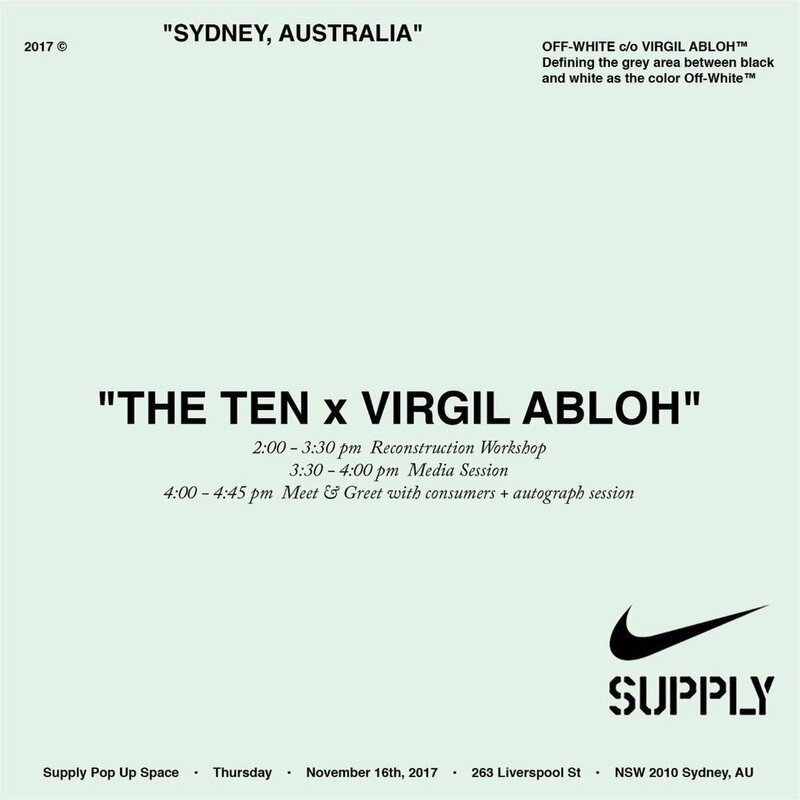 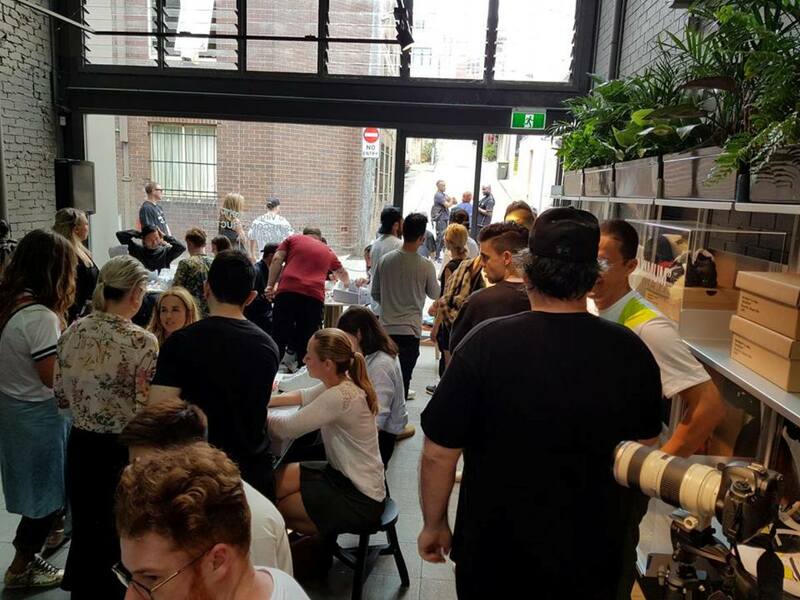 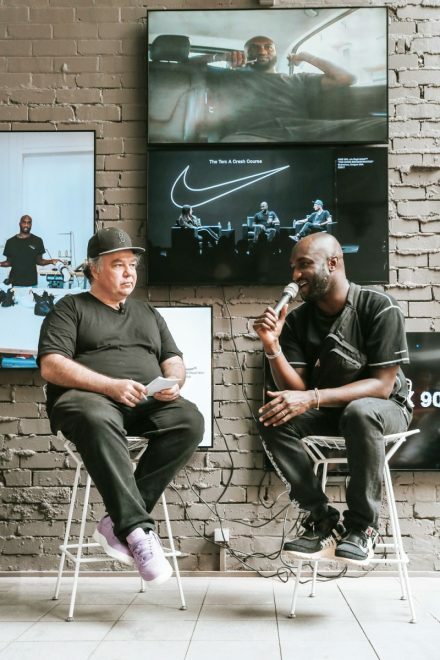 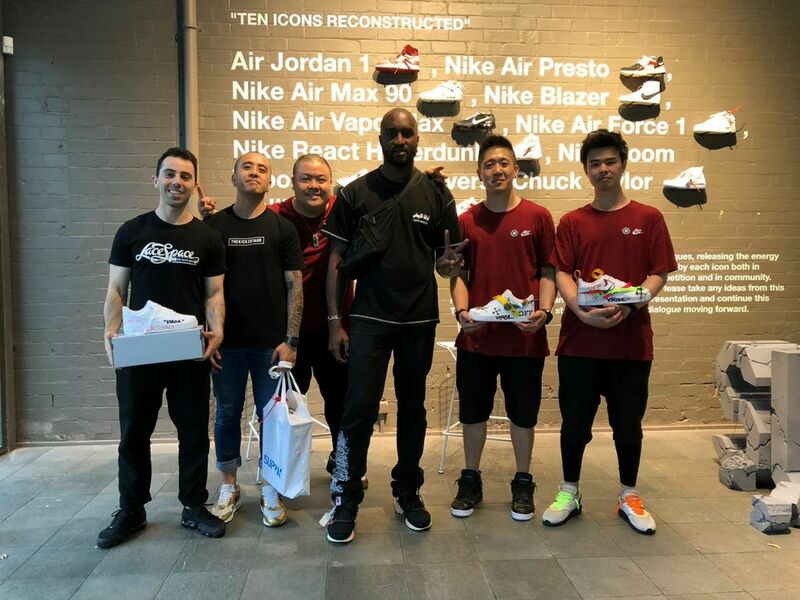 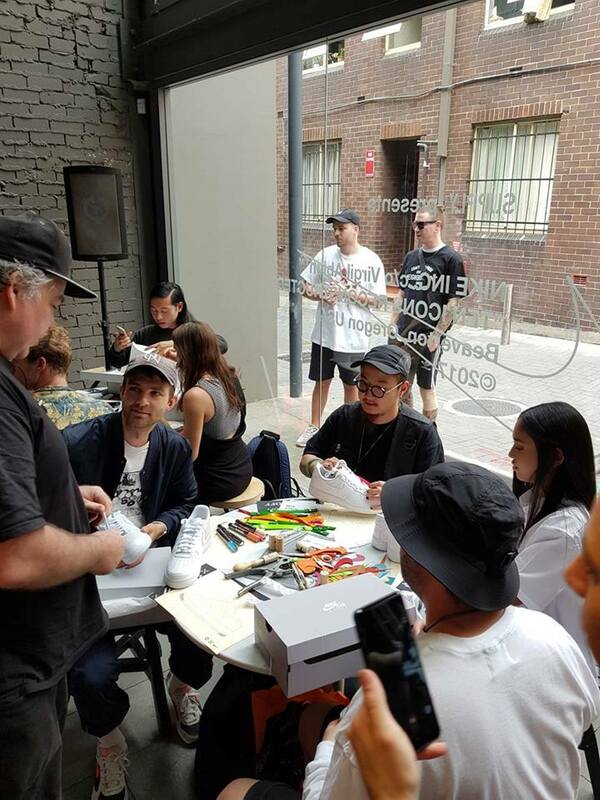 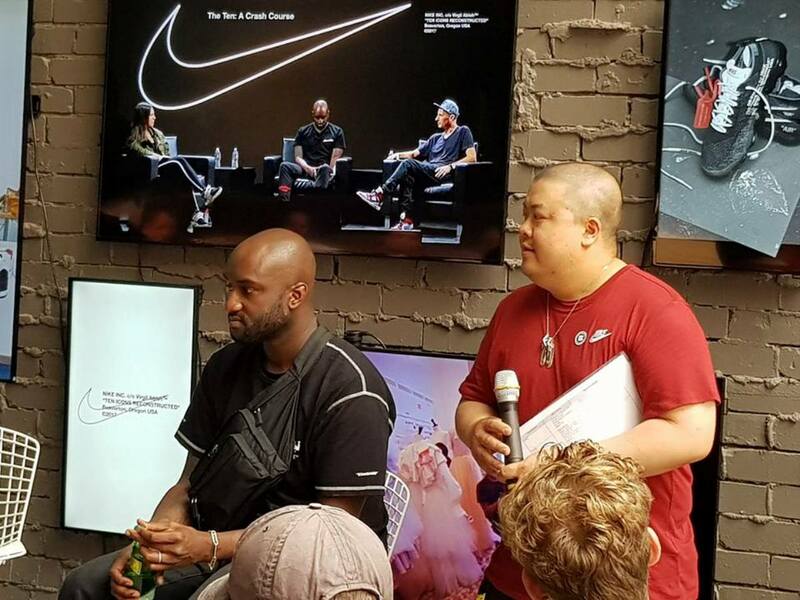 In celebration of his collaboration with Nike, ‘The Ten’ pop up in Sydney, Virgil came to Sydney to talk to a large gathering of Sneakerheads and industry stalwarts about what it’s like collaborating with such an iconic brand and his key to success right now. 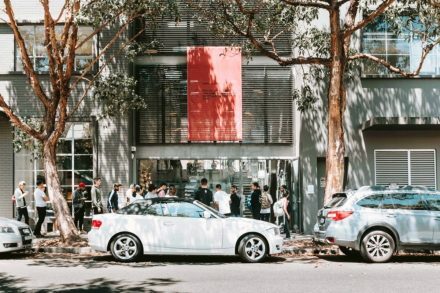 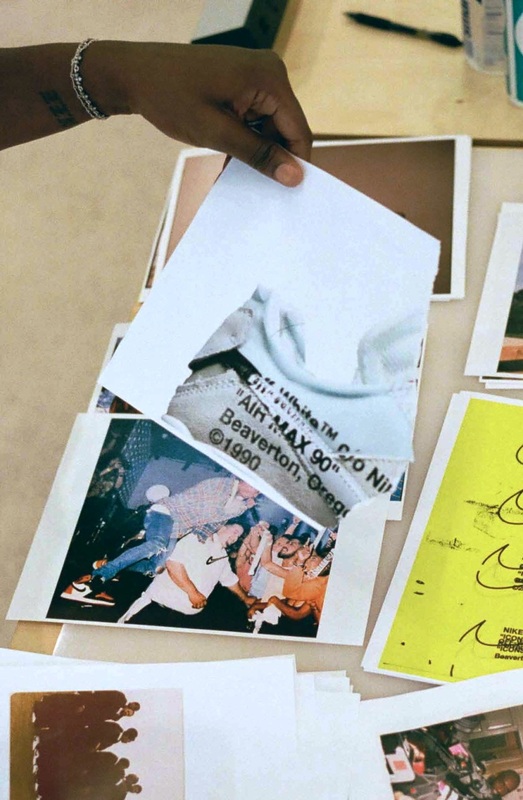 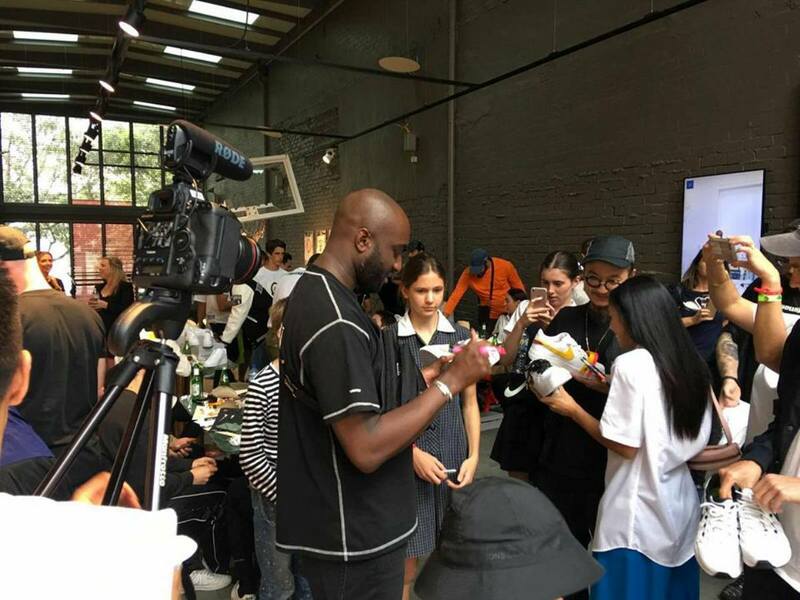 Drawing crowds from far and wide, word soon spread that the designer himself, Off-White founder and creative director Virgil Abloh would be making an appearance at the Pop-Up. 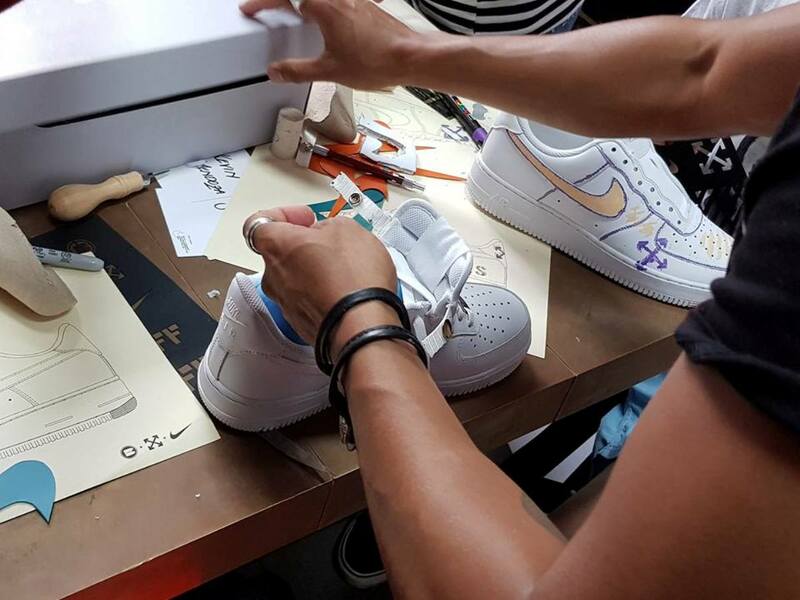 Virgil didn’t disappoint and arrived around lunchtime to give a talk and to host the Workshop around a Nike icon, the Air Force 1 on its 35th birthday. 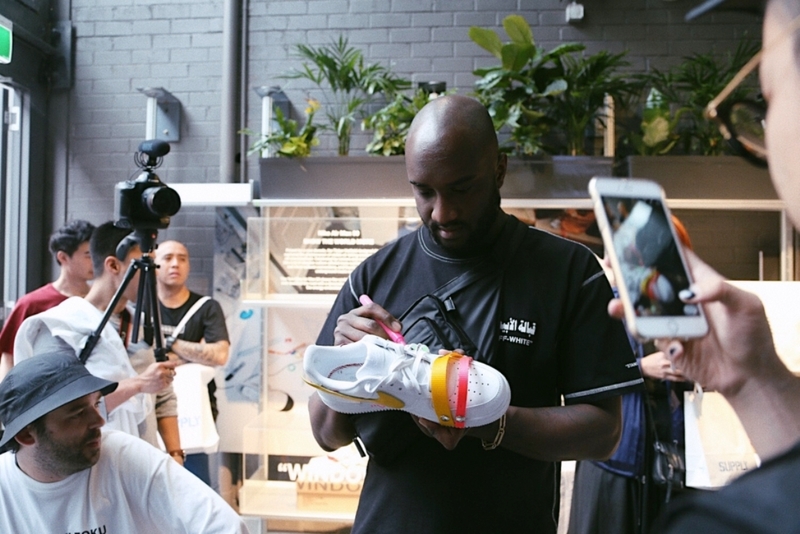 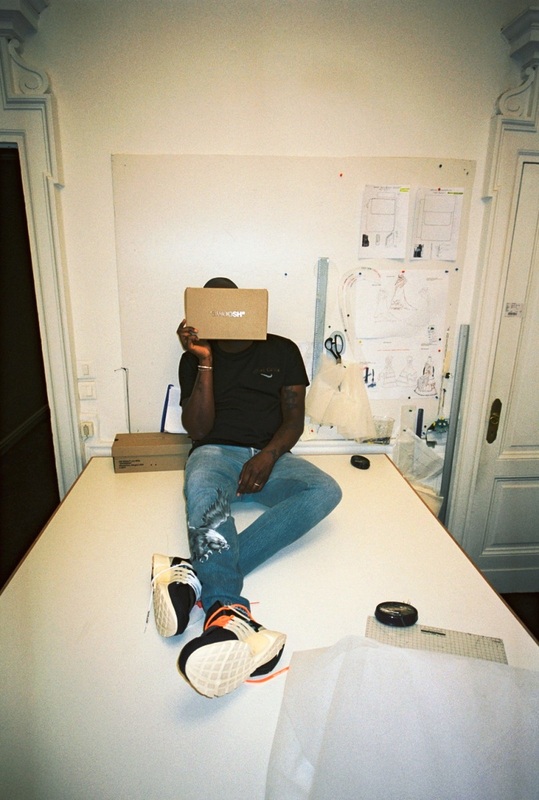 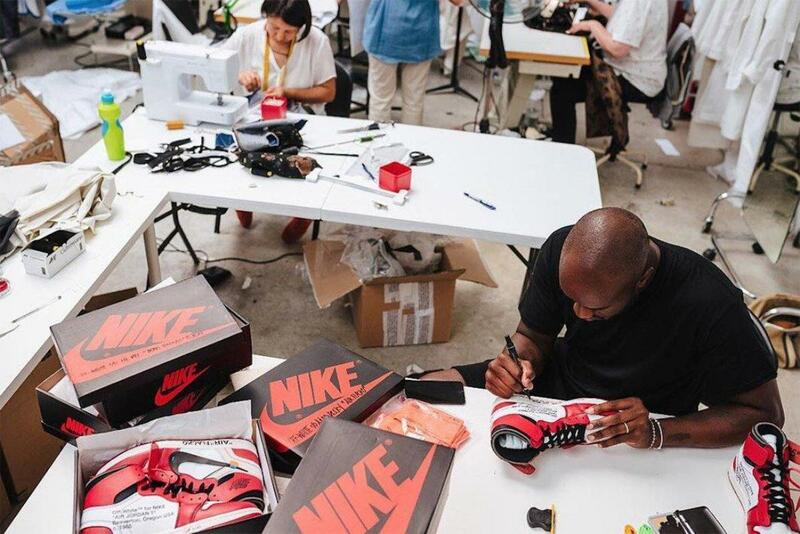 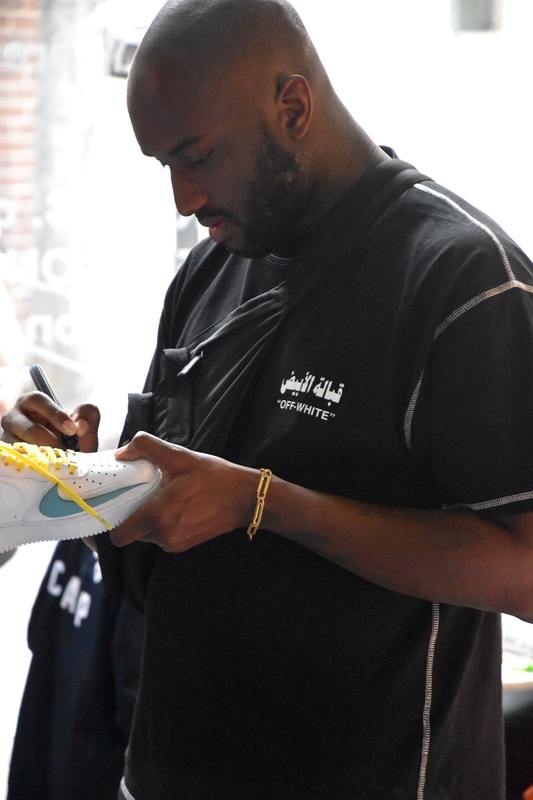 Virgil Abloh kindly held a Reconstruction Workshop in the top level of Pop-Up space and those VIP guests lucky enough to have scored an invite got a personal insight into Virgil’s creative process, and got to flex their own creativity when they reconstructed their own pair of Nike Air kicks right in front of his eyes. 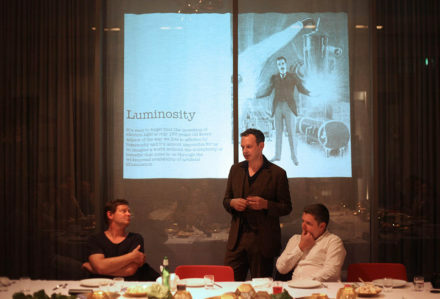 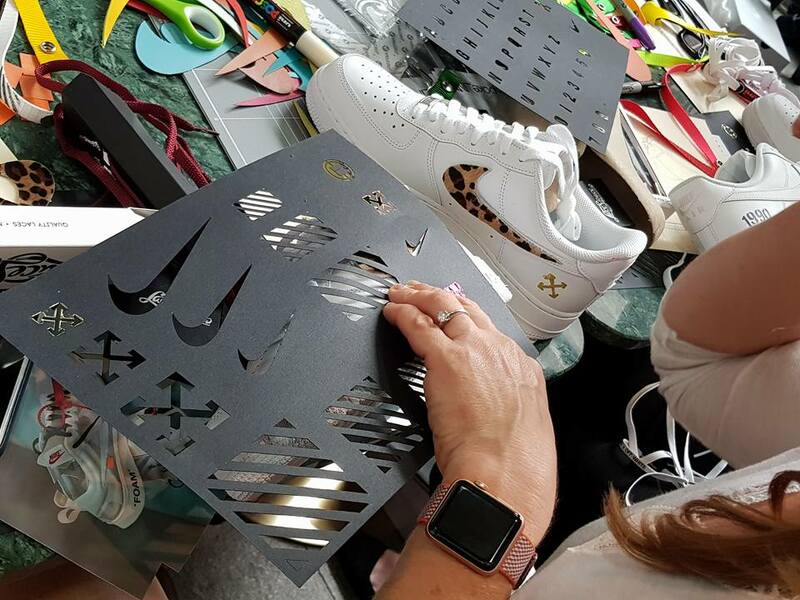 Customisation workshops pushed this ideal even further, giving consumers the opportunity to just do it and use a bare bones silhouette to recreate an icon in their own image. 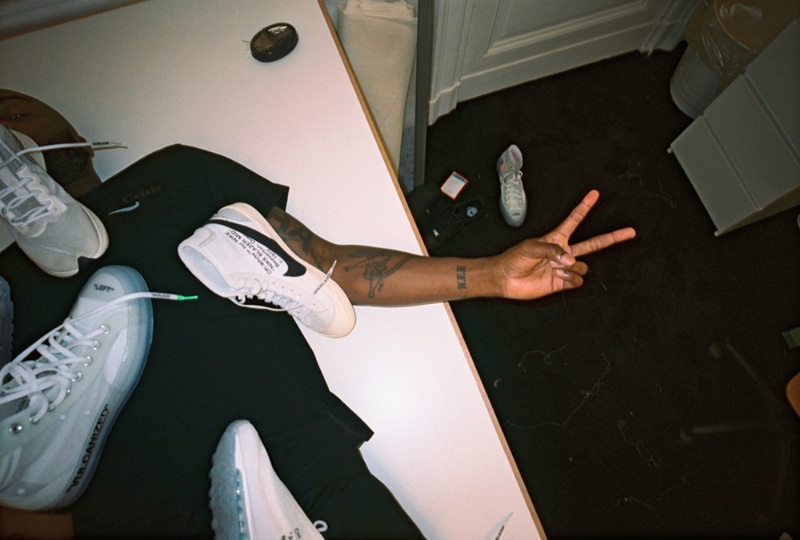 By stripping each shoe down to its core, Nike’s vision remains while allowing for Virgil to weave Off-White’s aesthetic into every element of the shoe, such as sewn-on swooshes and monochrome palette. 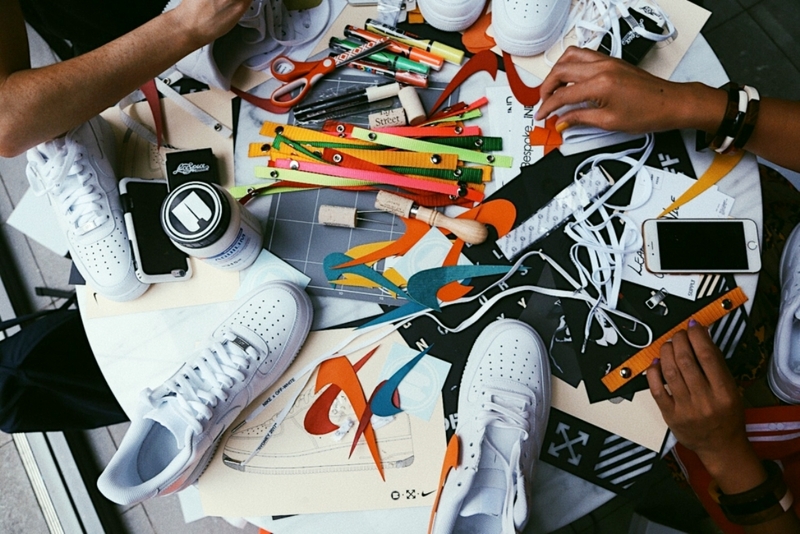 It is this freedom of expression the sets this collaboration apart from the pack. 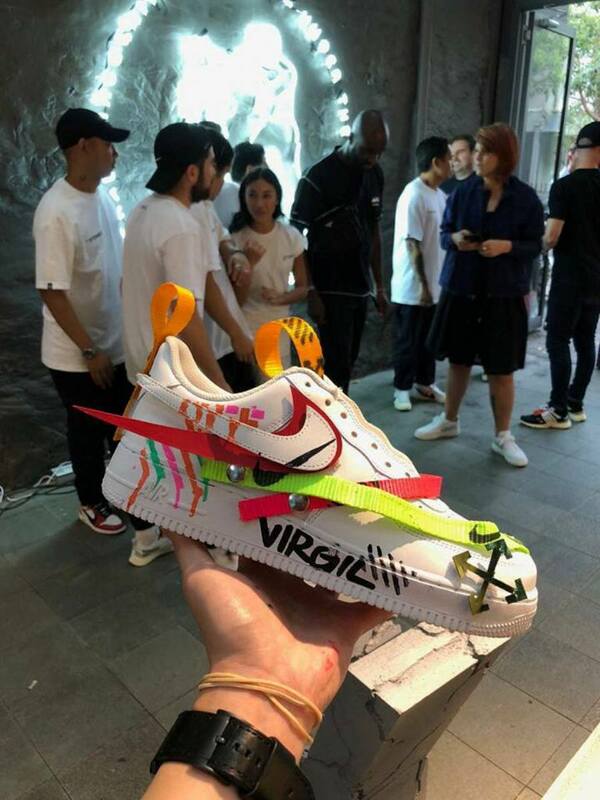 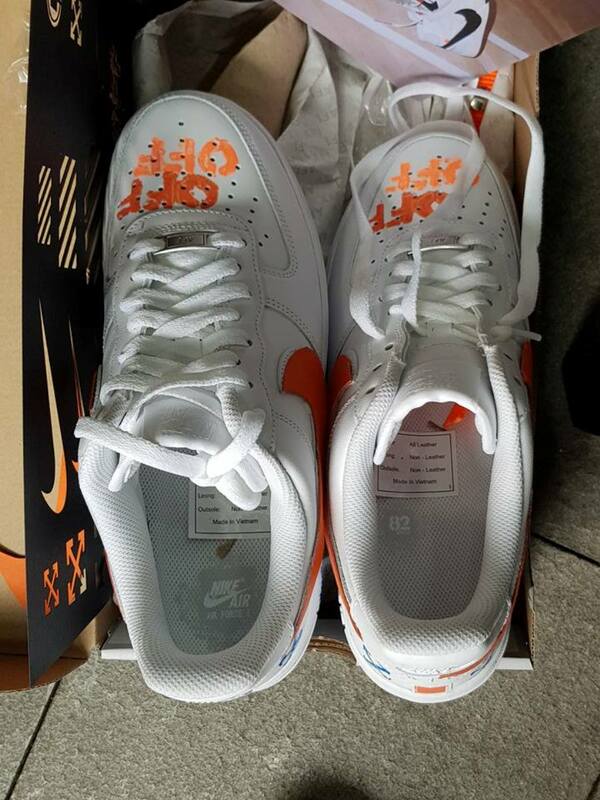 Where we are used to seeing additional or collaborative branding, Virgil toys with the branding provided by Nike. 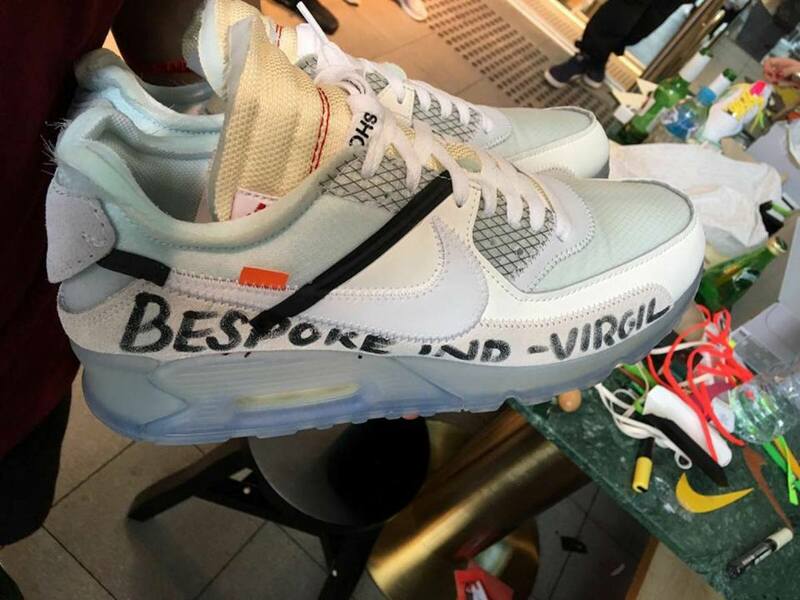 The size and placement of swooshes are altered in ways that are foreign to both the shoe and the brand, with Off-White’s signature quotation marks acting like design notes on a blueprint. 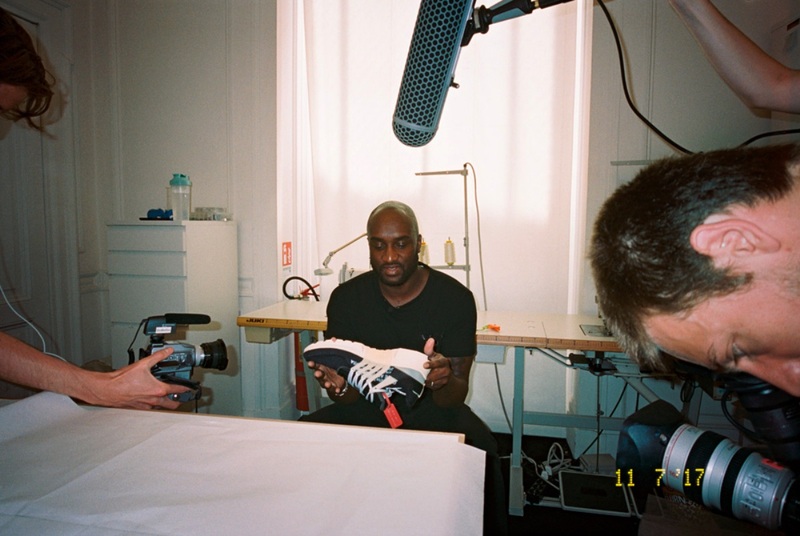 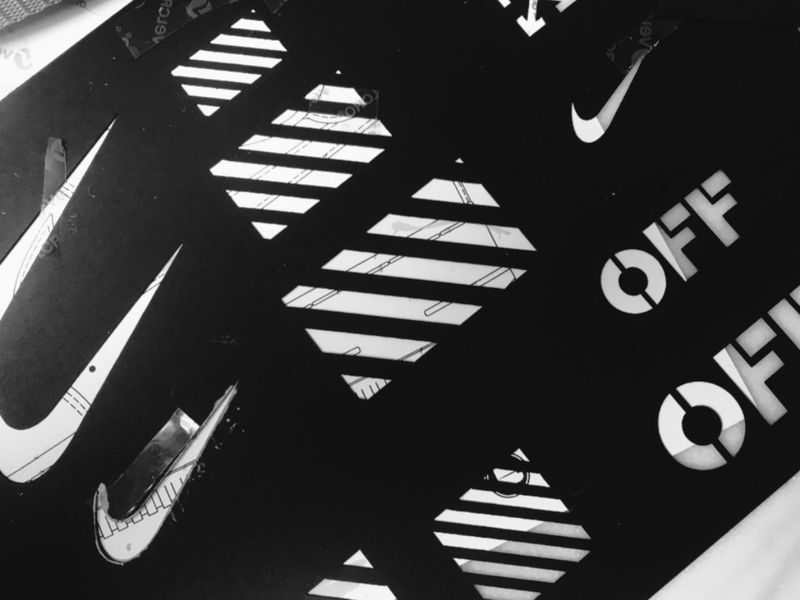 It is the act of going backward that pushes these designs forwards, a process that is fundamental to the legacy of Nike and champion by Abloh across each model. 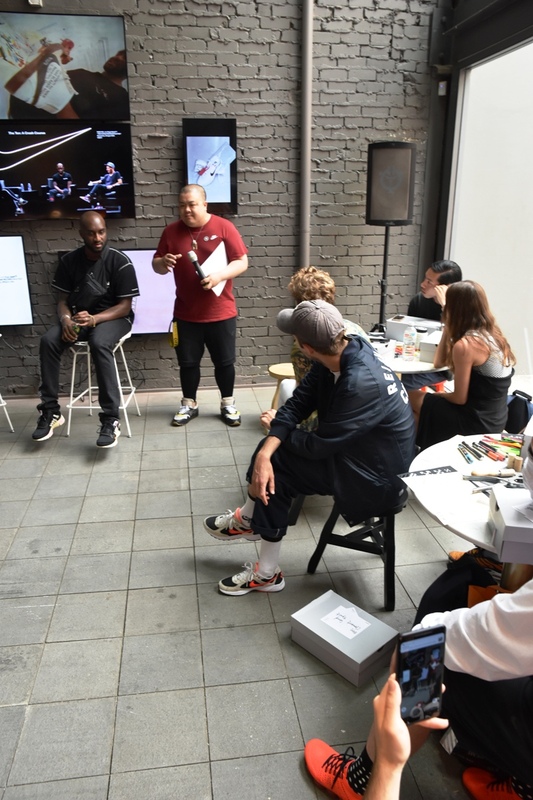 It’s here where the true success of the partnership shines through, as the ‘Just Do It’ slogan is embraced and put into practice. 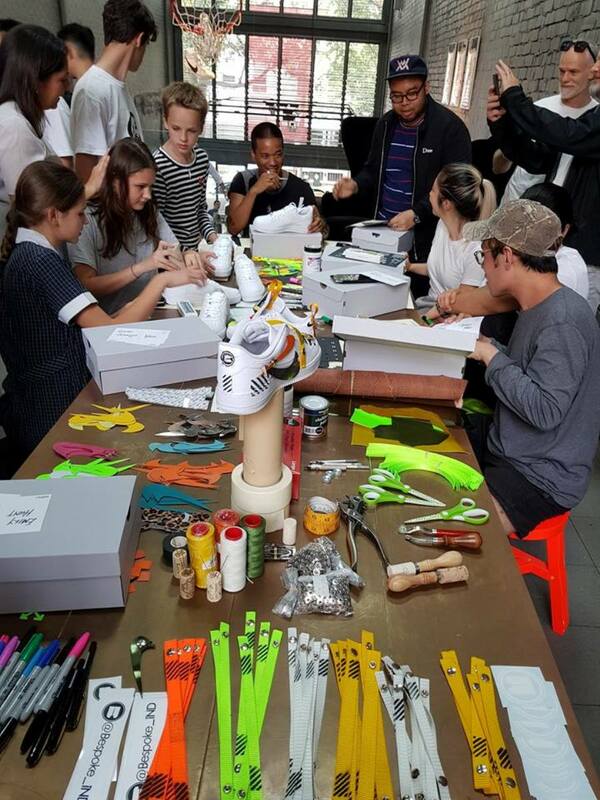 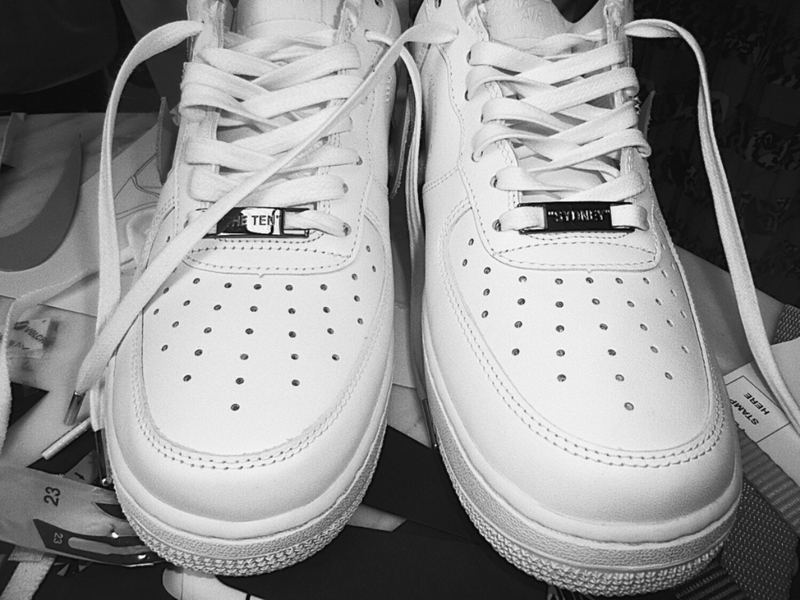 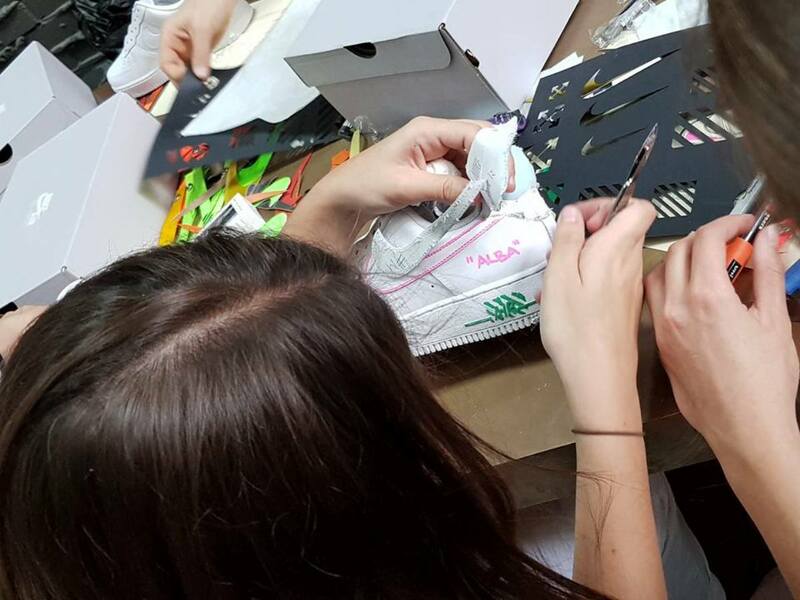 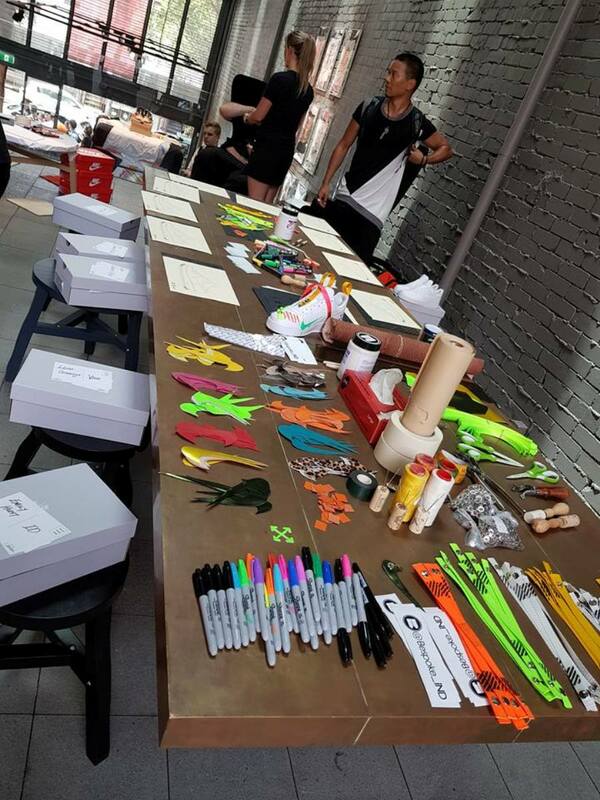 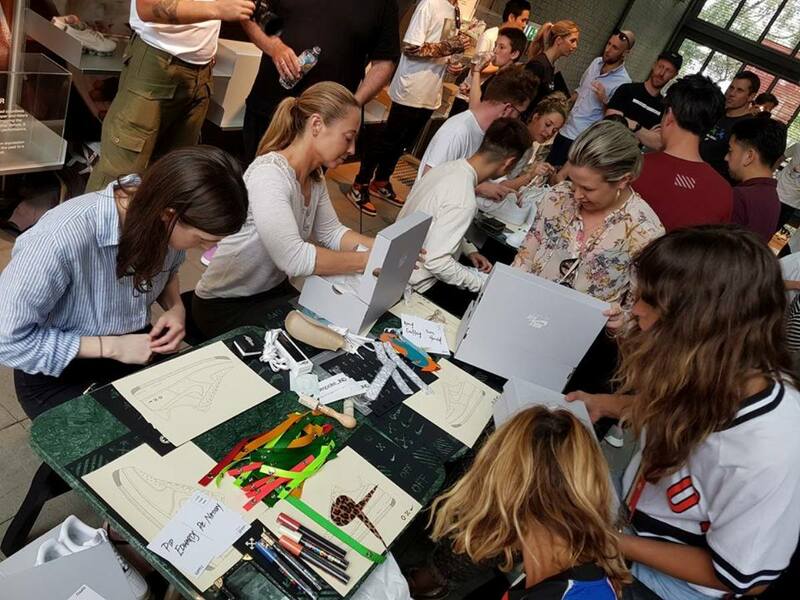 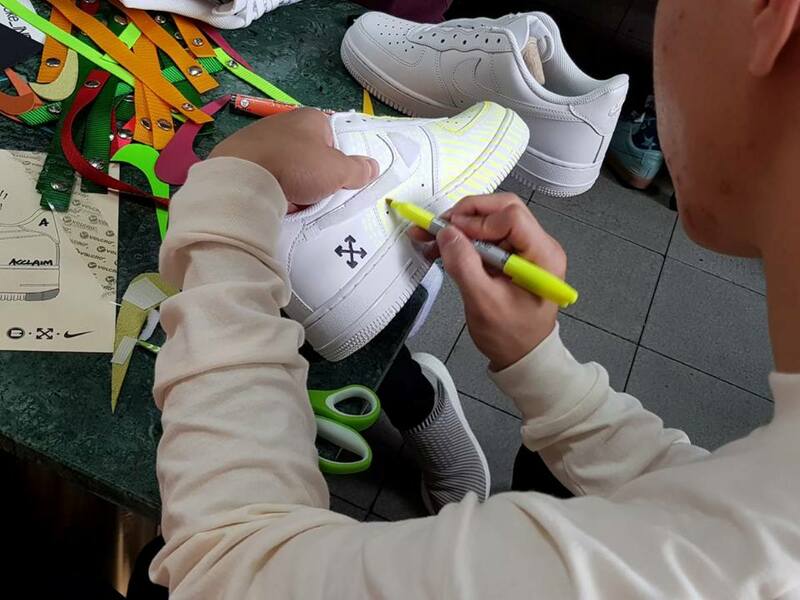 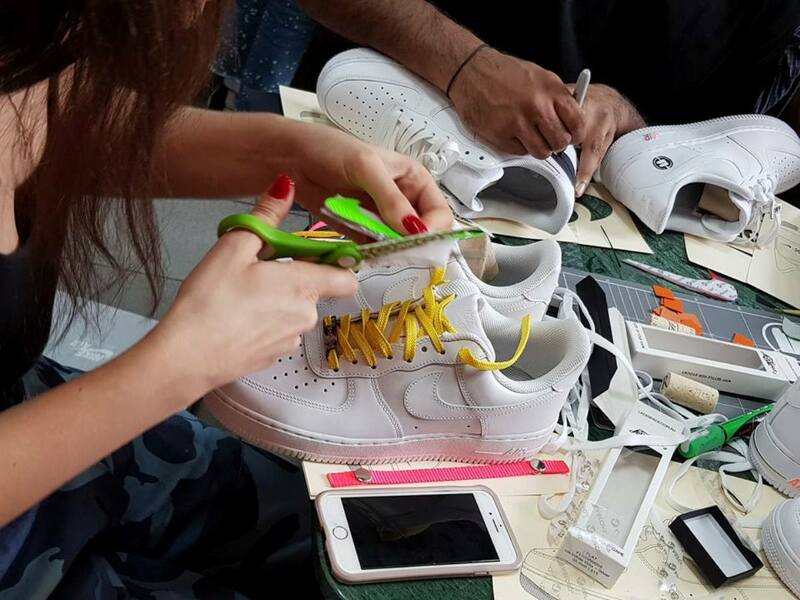 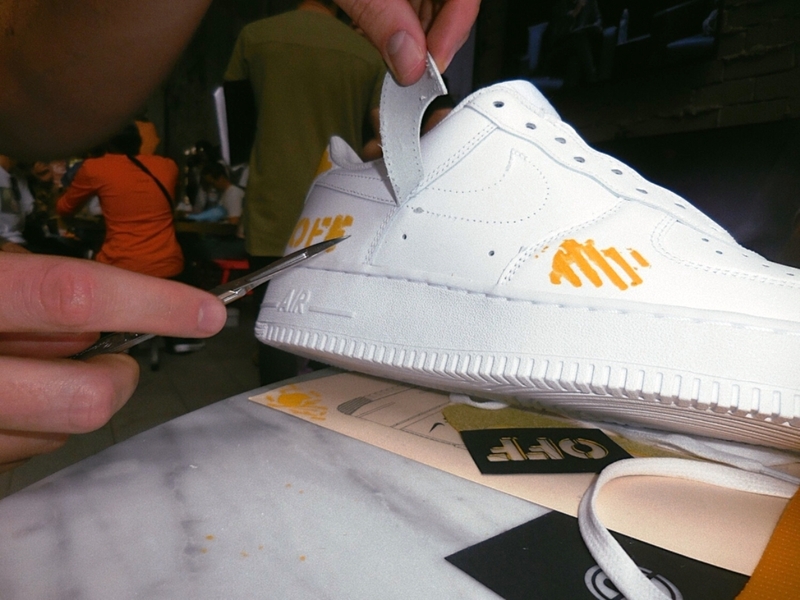 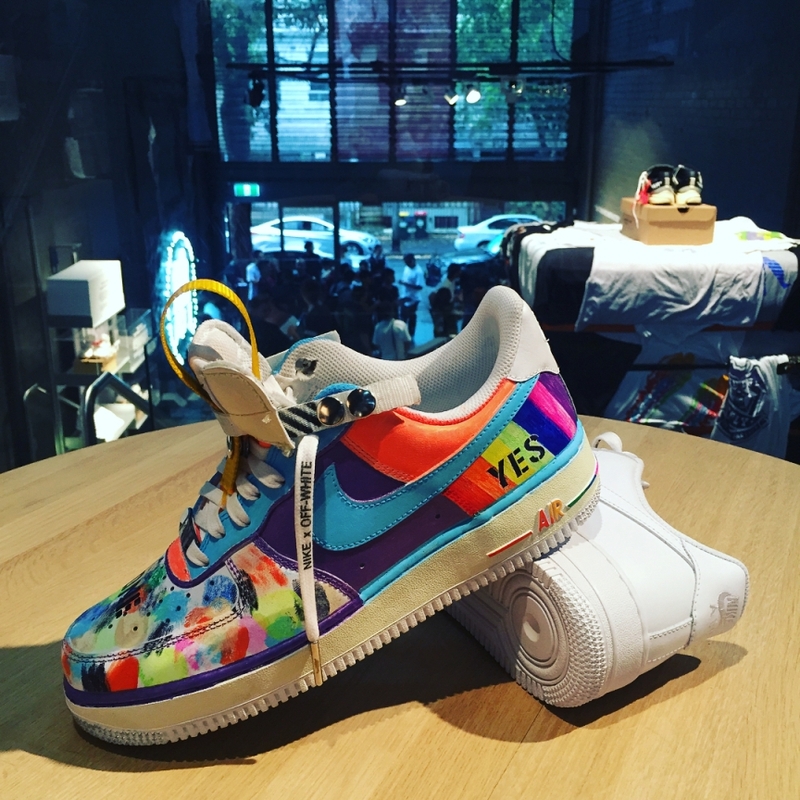 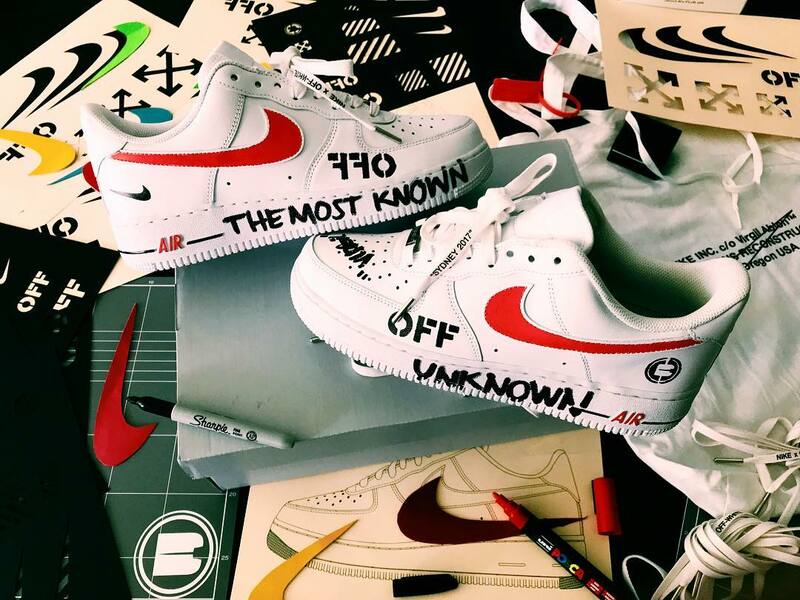 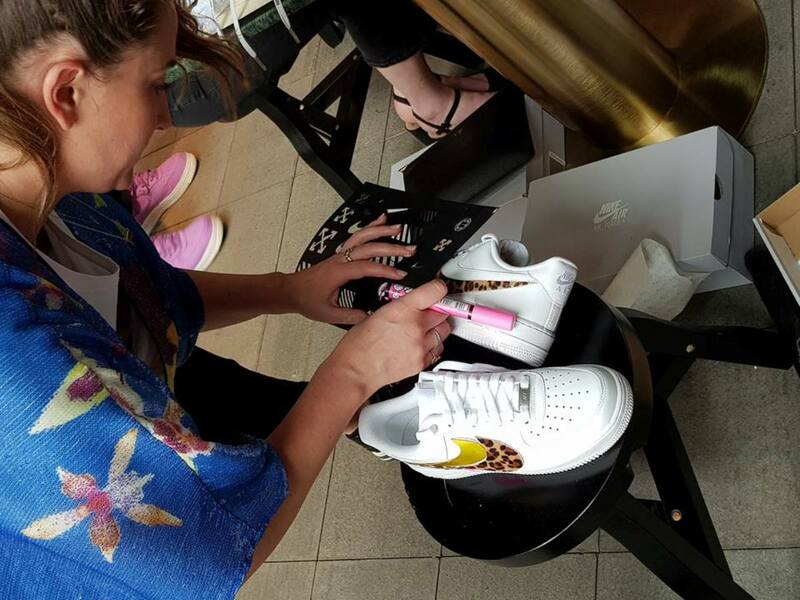 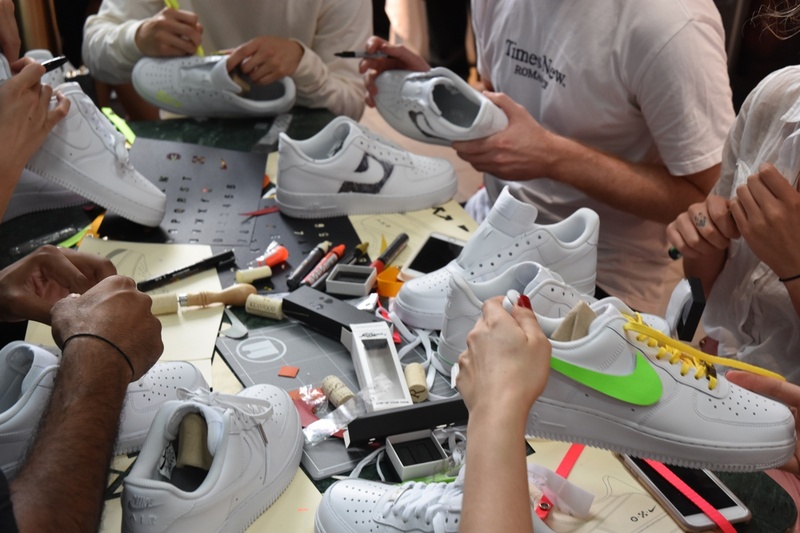 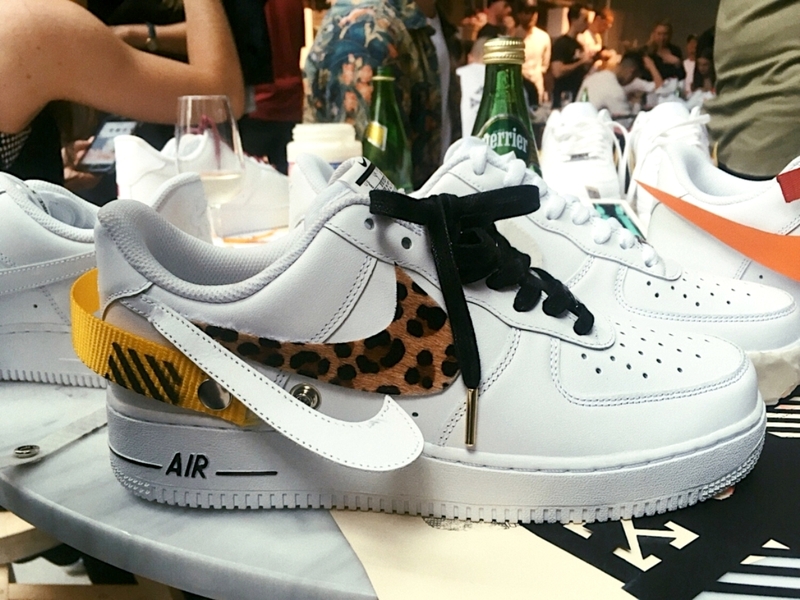 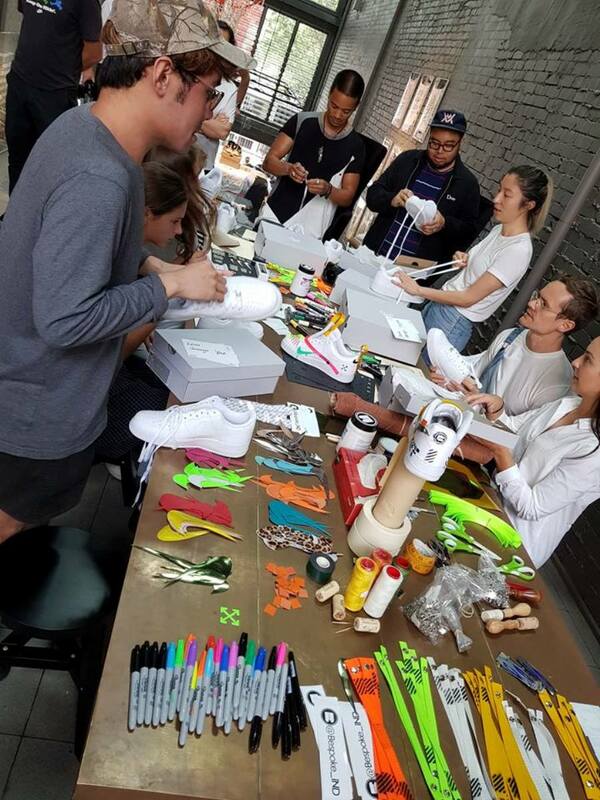 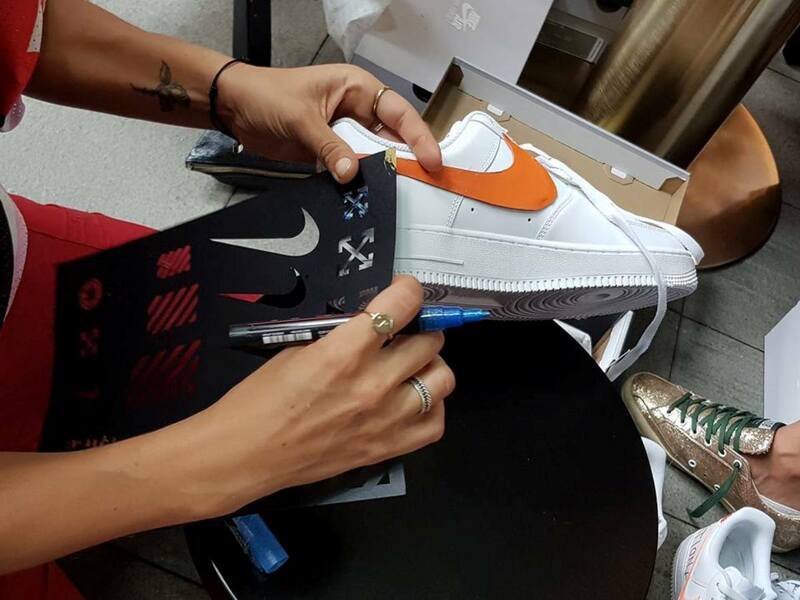 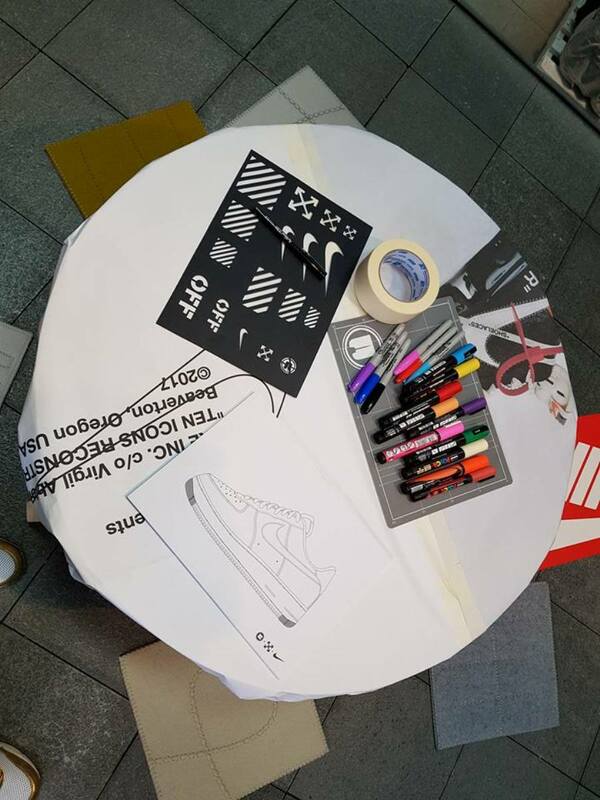 While the white-on-white Air Force 1 is a masterpiece in itself – favoured by everyone from the Roc-A-Fella stable to Nelly – here was the chance for the Workshop attendees to get in touch with their Arts and Crafts side, on a more unusual canvas. 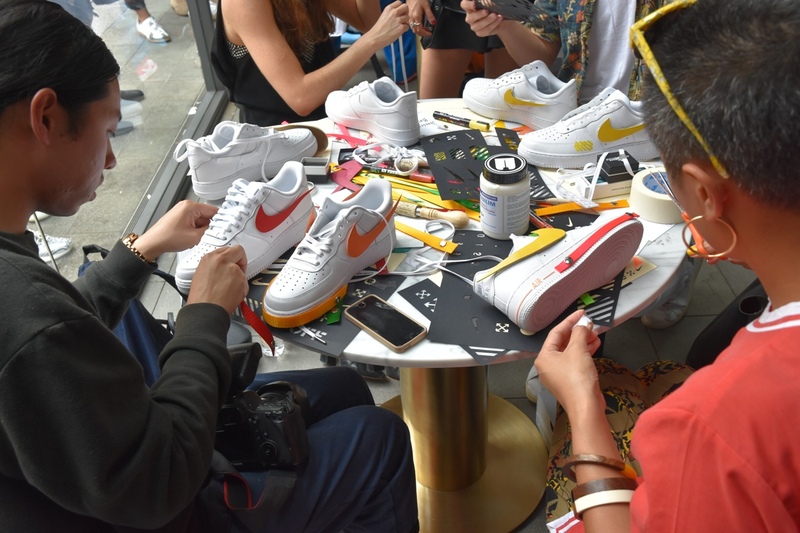 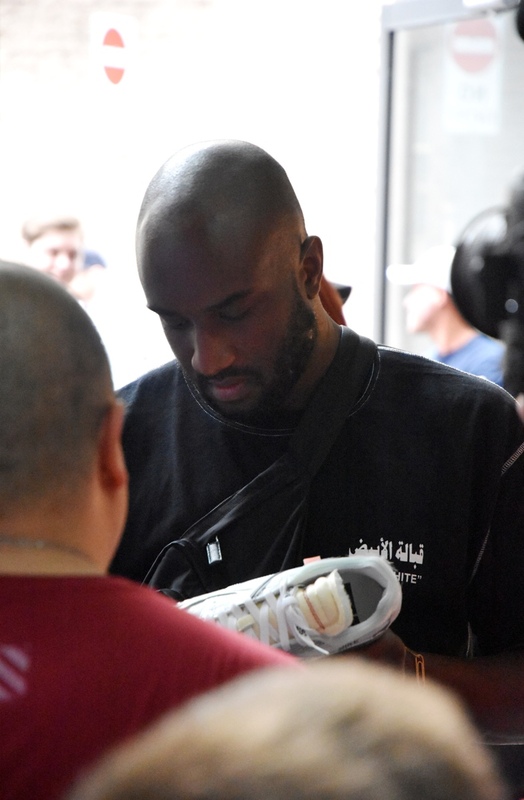 Some attendees used scalpels to remove full panels and tongues from their shoes, while others kept it more reserved with more downplayed, intricate detail. 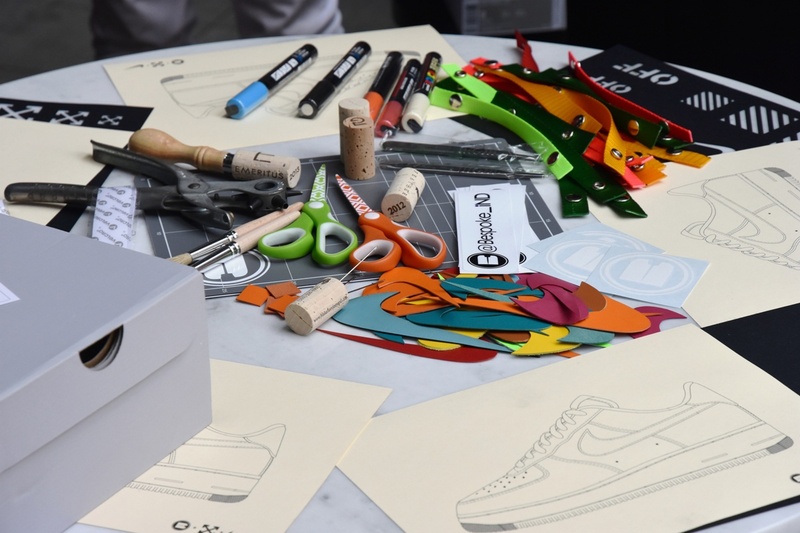 Others simply scribbled on any blank space they could find, which seemed to be a popular and effective approach. 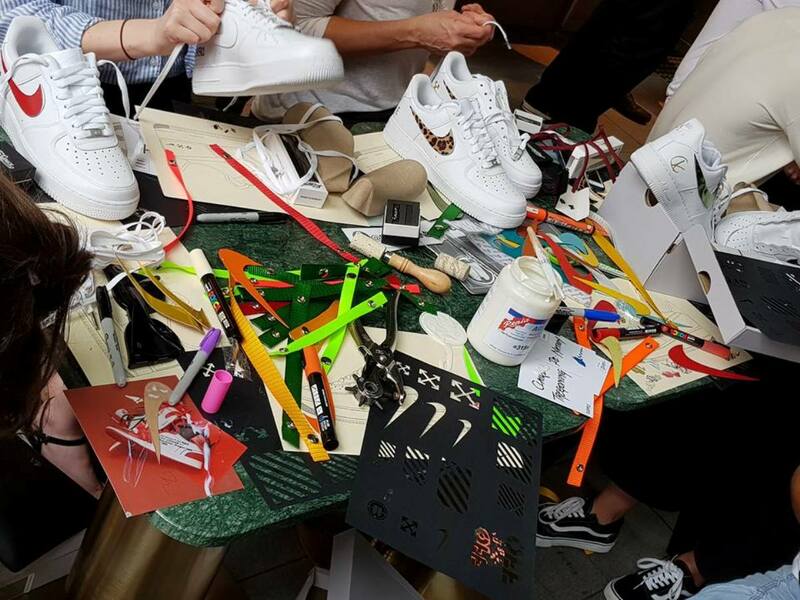 So how did our arts and crafts session go? 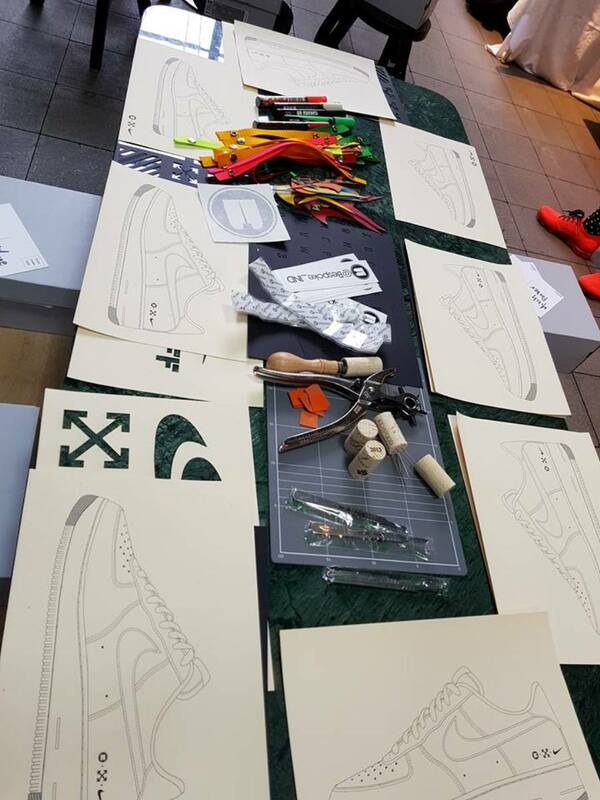 …………………….. Let’s just say that designing a shoe is a lot harder than it looks !!! 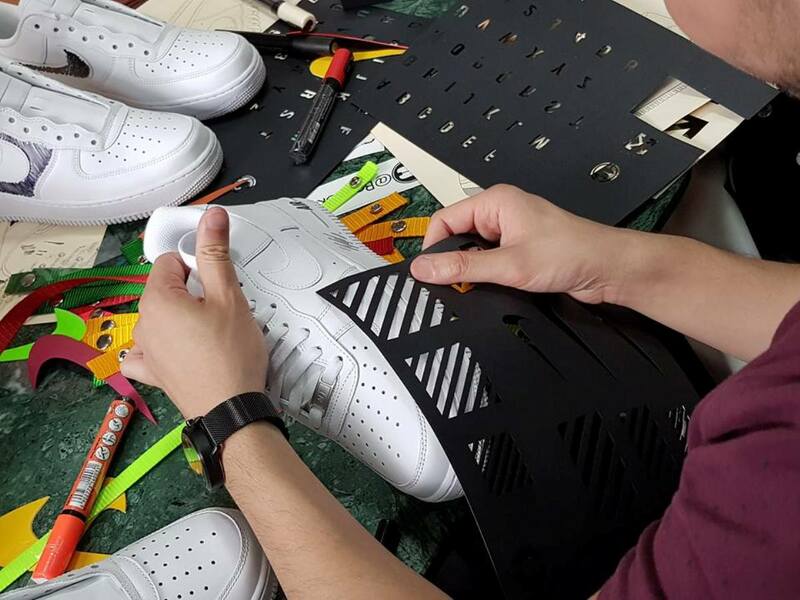 The ultimate commodity in the shoe game is rarity, and nothing jacks up desire more than the promise of one-of-one production. 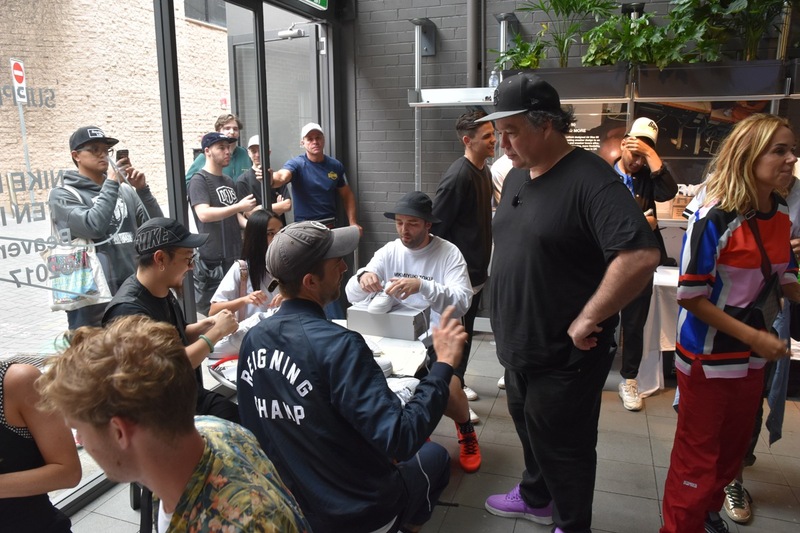 The crew at BespokeIND know all about that caper. 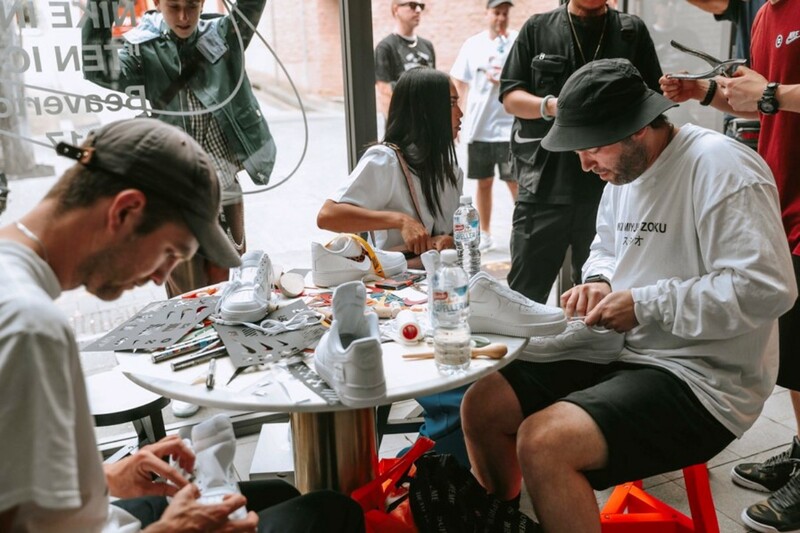 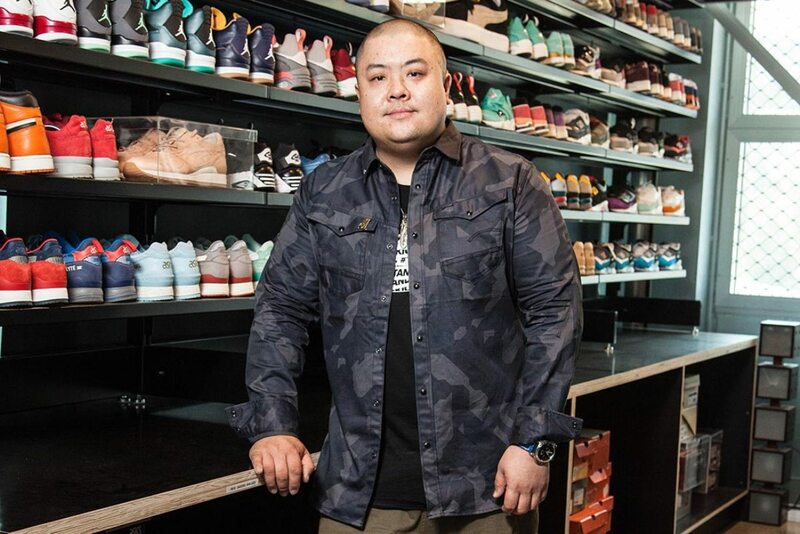 Having recently established their workshop in Melbourne, they are already making headlines by producing hand-built sneakers with an unprecedented eye for detail. 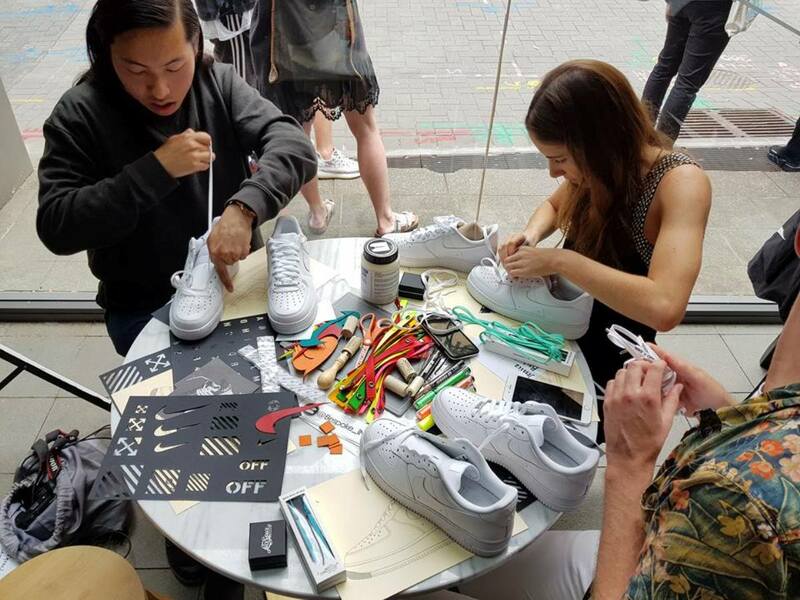 Exotic leather remakes, superb soleswaps and all-new designs built from the ground up – this is a one-stop shop of limitless creativity. 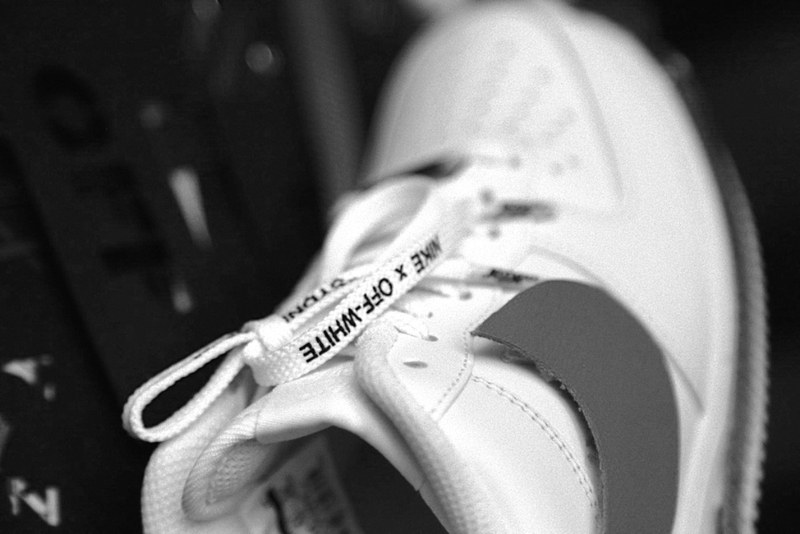 We’re a bespoke atelier, focusing on shoe making, but we’re capable of working on anything with a stitch. 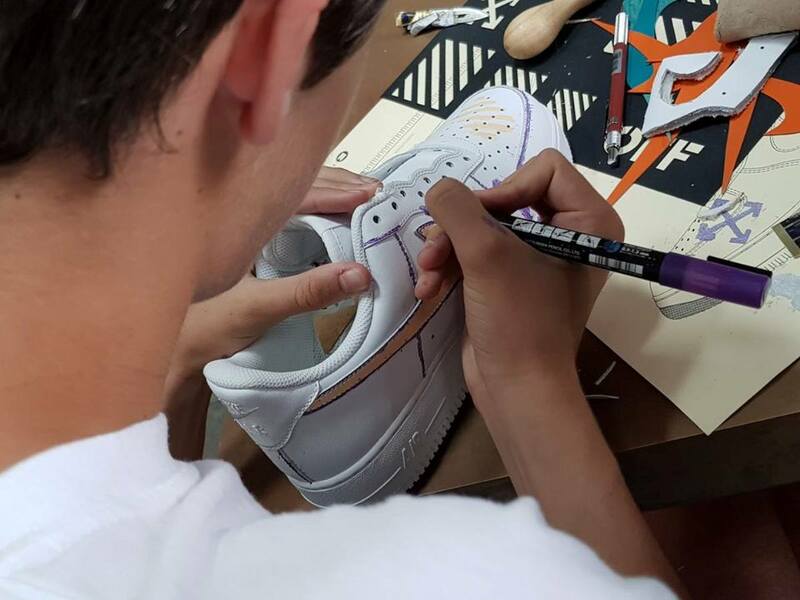 I like to think we’re bringing the handmade craft of the old days back into sneakers, which hasn’t really been done before. 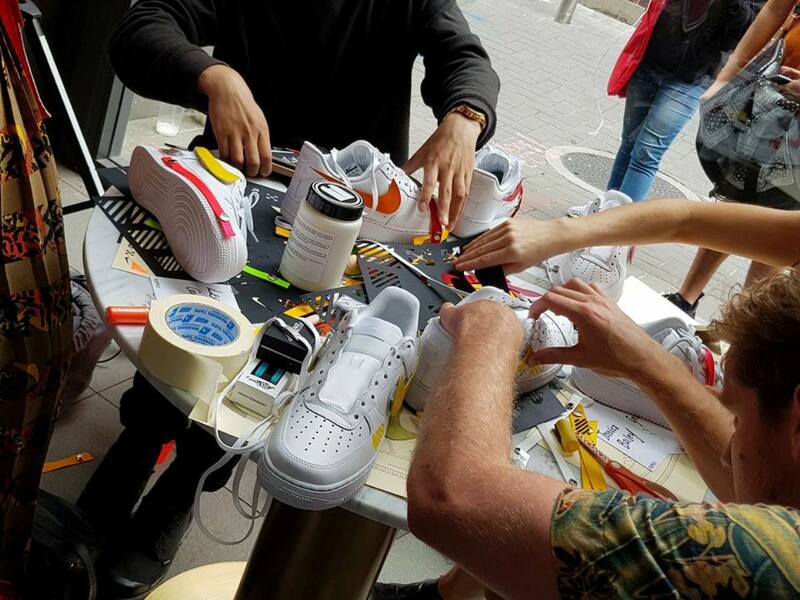 We don’t limit ourselves to just footwear though. 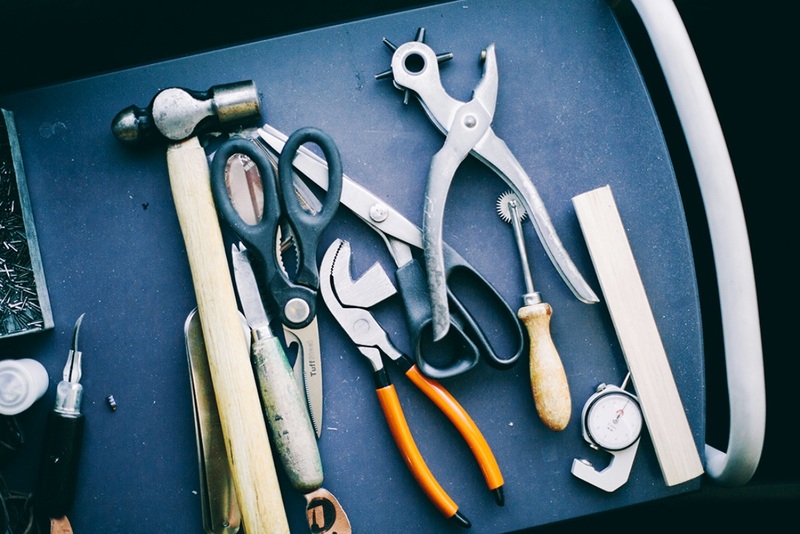 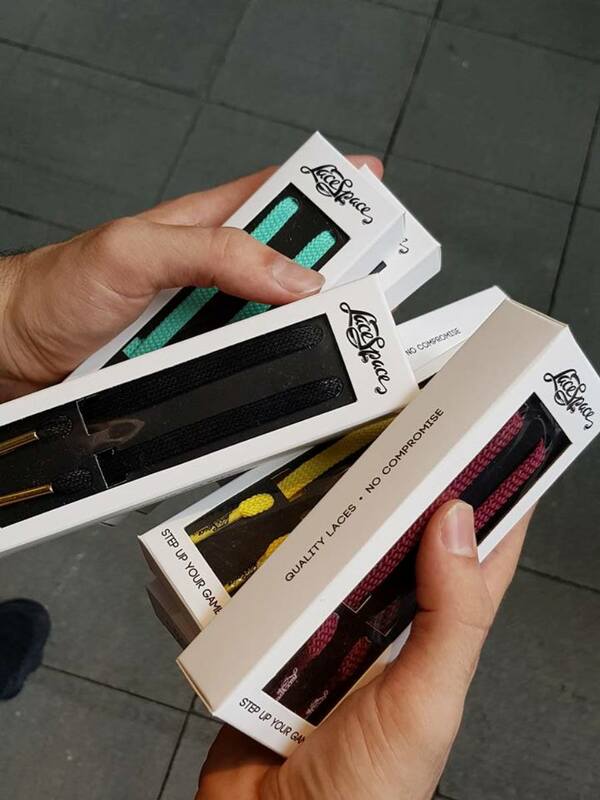 Watch straps, knife rolls, handbags, wallets – we’ll do anything our clients want. 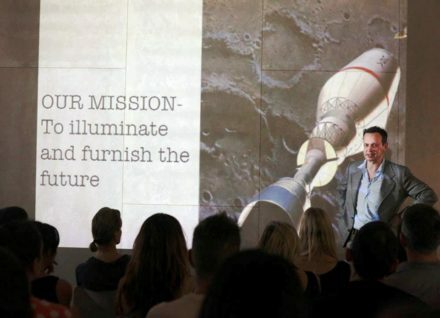 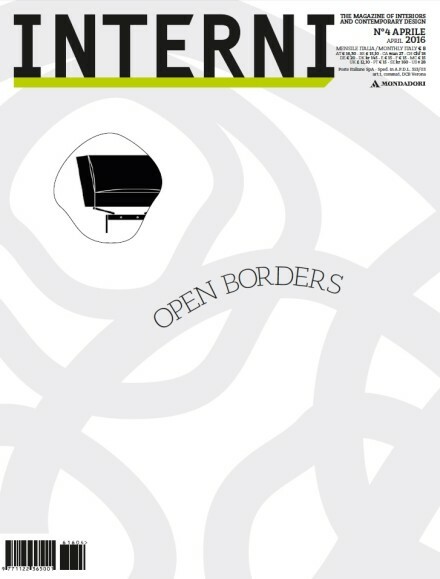 If they have an idea we can make their dream a reality.